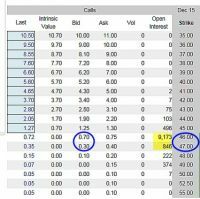 Option trading basics teaches us that the concept of put-call parity means that for every call option price, the corresponding put option (same stock, strike and expiration) will have an implied value. 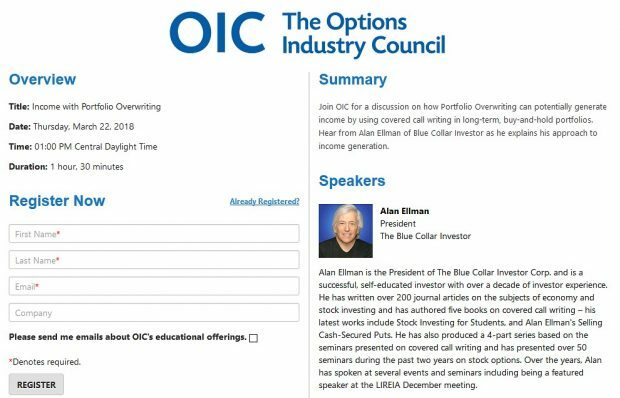 For example, if Company BCI is trading at $50.00 per share, if the $50 call option generated $1.50, the put option would also be expected to generate $1.50. The reason for this is that if there was a movement away from this parity there would be an arbitrage opportunity where one option could be bought and the other sold for a risk-free profit. Now this concept applies to European style options. Since, in reality, we are dealing with American style options, dividends and interest rates need to be factored in. As an example, if the $50.00 stock had an ex-dividend date prior to expiration and the dividend amount was $1.00, the call option would be worth less and the put option more because share price will drop by the dividend amount on the ex-date. This will impact calls negatively and puts positively. If there was a disparity between the put and call premiums at this strike it would set up an arbitrage opportunity for market makers to take advantage of and generate a risk-free profit…not fair to us. Now the two time values are in sync, the call at $1.50 and the put at $1.45. Put-call parity is an important concept in option pricing as it prevents unfair arbitrage opportunities. If these opportunities did present themselves, it would benefit market-makers, not us. There are factors that would create a discrepancy between the same strike prices for the same stock and expiration. These include interest rate factors, dividends and the moneyness of options. Understanding these concepts will elevate us the elite status as covered call writers and put-sellers. Click on this link for our contest video and entry form. “With the economy getting back on its feet, I think the markets will see more consumer confidence. With the potential rate hike everyone seems to be talking about though, it might suffer a minor setback. I think it will rise but a conservative rise”. Thanks for the great response we’ve had to this event. Keep those entry forms coming. We allow two per email address and the deadline is MONDAY November 30th. Consumer spending, a bright spot, increasing at a 3% rate. For the week, the S&P 500 rose by 0.05% for a year to date return of 1.52%. BCI: Same stance as last week: Cautiously bullish using an equal number of in-the-money and out-of-the-money strikes. I remain fully invested using 50% in-the-money strikes until the Fed makes its position on interest rates known and evaluating the ensuing market reaction. I believe that most institutional investors have factored in a 25 basis point rate hike with moderating guidance from the December Fed meeting. 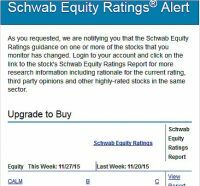 The Weekly Report for 11/27/15 has been uploaded to the Premium Member website and is available for download. I heard that the New York Stock Exchange is no longer allowing stop orders and good until cancelled orders. I can’t understand why they’re doing this and how much it will effect us? I’d appreciate your take on this. This new rule will begin on February 26th, 2016 and it appears will have no significant impact on retail investors. The purpose of the rule is to protect us against temporary periods of volatility (like the flash crash of a few years ago) where stop orders may result in a trade execution against our best interests. The reason I believe that it will be a non-factor for most of us is that stop and GTC orders are usually managed on “clearinghouse levels” before they reach the major exchanges. Once “activated” by these lower-levels of exchange venues, they are then passed on to the major exchanges as market orders. The NYSE would argue that retail investors should consider price alerts rather than limit or GTC orders. Bottom line: At this point it appears that the new ruling will have little to no impact on us. Until I read the Complete Encyclopedia for Covered Calls I never realized that a stock price goes down when there is a dividend. Can we assume the price will always go down by the dividend amount on the ex date and if your answer is yes, what is the big deal about dividends? The price movement of the stock on the ex-date will be influenced by the amount of the future dividend distribution but also by all the other factors that impact share price on a daily basis. A stock may still go up on the ex-date. 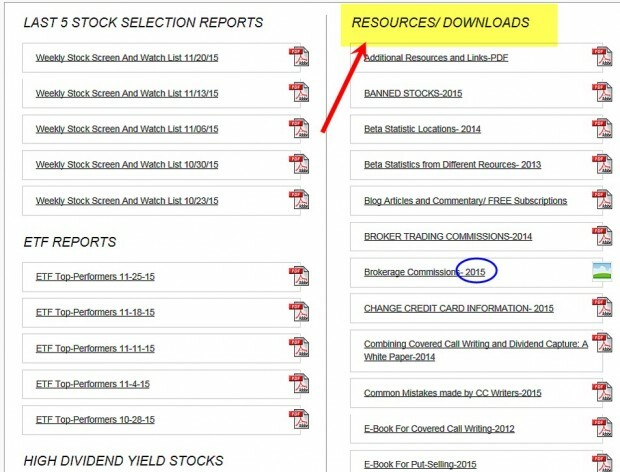 Investors like dividend-bearing stocks because they represent reliable income streams. Generally, these are corporations with adequate cash reserves available to share with stock holders and not needed for daily operations. Newer, growth companies may need this cash for research and development and these growth companies may appeal to other investors. Then there are companies like Apple Computer which are cash-rich to the extent where they can do both. I own 800 + shares JCI. I accumulated share with DSP Plan starting 1997 with $50 – $100 each month until recently. I JCI a good candidate for Selling Covered Calls? 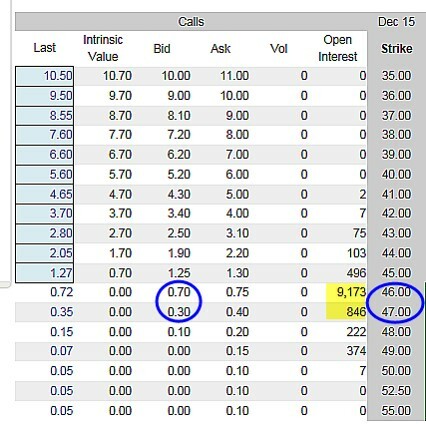 JCI has adequate option liquidity (open interest) for near-the-money strikes) as shown in the yellow field below. I’ve circled the per-share 3-week returns for 2 out-of-the-money strikes. You must ask yourself if you are willing to sell the shares at the strike prices and that will dictate the strike selection and position management techniques necessary for successful outcomes. CLICK ON IMAGE TO ENLARGE & USE THE BACK ARROW TO RETURN TO BLIOG. I found your website while researching covered calls and am very interested. I hope you have the time to answer a couple preliminary questions I have from watching your beginners course video. I am looking to trade the weekly deep in the money covered calls with a portfolio of $100K, looking for a weekly return of 1-2% selecting options with at least 8% downsilde protection. From paper trading, I estimate that about 70% of these trades will be profitable and 30% will lose money. So if I have have 5 positions each week with a size of $20K, my profit will be (20 * 1.5% * .7) less (20 * .1.5% * .3) = 120 * 5 trades = $600/week * 52 = $31,200 annual. 1. Is there a way on most trading platforms to place a net credit stop loss on an entire covered call position? 2. Do you think this strategy / profitability is feasible (likely) or is this fantasy land? 1- Yes, many brokerages have “buy-write combination forms” which will allow us to set “net credit limit orders” to close complete covered call positions. Check with your broker to see if their platform offers this service. To achieve a 1-month return of 1.5% with 8% downside protection, you would be dealing with highly volatile stocks so management skills would be critical. I would respectfully ask you to review the advantages of out-of-the-money strikes in bull market environments and allow some strategy flexibility. Thanks to Ricardo for sending the below upgrade to buy. Last week i sold a I-T-M contract (#1) of IPGP which, at that time, was an eligible stock. However, in this week´s report, it is banned. The question is what i should do in situations like this one: if unwind and use another financial soldier or still remain with this position open. What is your view on this? Once a position is entered, it is managed as described in my books and DVDs, NOT based on its disappearance (not “banned”) from our watch list (running list) the following weeks. If IPGP remains off the running list at contract expiration, you may choose to move the cash into a better-performer. Of course, position management is critical for all stocks in our portfolio. I bought ntes in October when it first appeared on your stock list. I didn’t sell any options for the November options because of the earnings report but I kept the stock and its up about $40 since then. My question is are there some stocks that we are better off not selling options and just letting the price rise? Thanks for the stock and your help. 1- Move the stock into our longer-term buy-and-hold portfolio, perhaps setting up an 8- 10% trailing stop loss order. 2- If hundreds of shares are owned, sell options on half and hold the other half as a longer-term holding. 3- Sell deeper out-of-the-money calls, generating lower initial returns but allowing for greater share appreciation (this would be my go-to strategy). We are viewing this trade now with hindsight…when the stock was $140 we didn’t know it would increase in value this much and this fast. You asked one of the great questions we all grapple with: when and to what degree do we use covered calls? Everyone’s answer will vary to fit their investing temperament. I write calls on all dividend stocks but never more than 50% of growth stocks like NTES. It makes my blood boil to miss great run ups because I am covered! But others will see it differently. Thanks for your detailed answers. I’m still learning and value the insight from more experienced investors. If you believe that a stock will run up (based on your analysis) and you will miss the upside with a covered call trade, another idea you might want to consider is to buy upside calls on those stocks. This way, you will be able to focus on the covered call…your primary strategy…while participating in upside movement. You will need to watch the trade so you can sell the call if the stock drops or you get close to expiration. A word of caution, you will need to be careful because if you are wrong, the upside call premium will lower your covered call return. 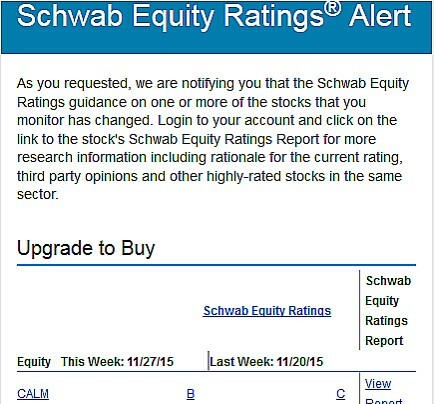 The new report for 12/4/14 will reflect the new Risk/Reward rankings.